This document explains how to add Tabbed Content to your pages. For an example, see https://wiscweb.wisc.edu/page-elements/tabbed-content/. Tabbed Content allow you to have a series of editable, conjoined tabs to add to your site. Each tab displays the content within that tab, while other tabs remain hidden until they are selected, similar to tabs in a web browser. You can add text, media, or embed third party code (e.g. YouTube) to display in your tabs. 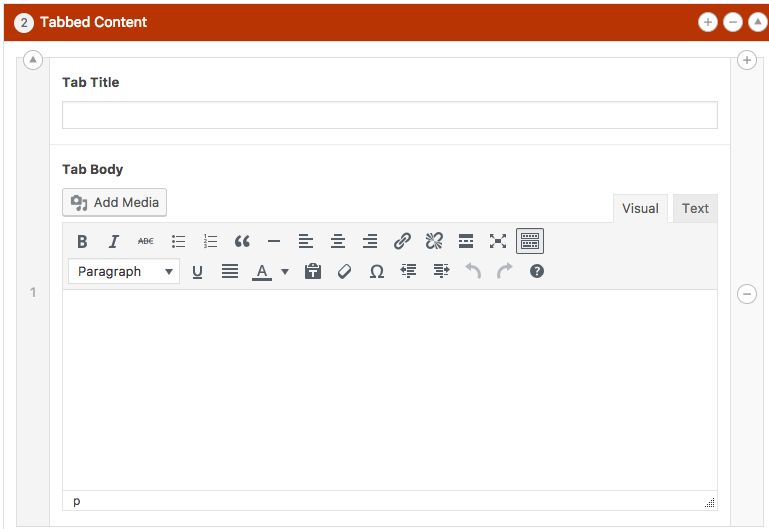 Tabbed Content is available in only One Column Content Layouts. You should not use Tabbed Content if you need to directly link to the content of one of the tabs. Any information that requires a direct link should be its own page and not a tab. You cannot directly link to a specific tab. Navigate to the page on which you want to add Tabbed Content. Scroll to the Primary Content Area and the Layout on which you want to add Tabbed Content. On the Page Element list, click on Tabbed Content. 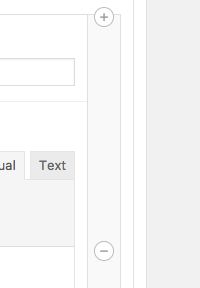 Tabbed Content has two fields for you to fill out, the title and the text area. The title will appear at the top of the tab and displays when it is open or closed. Tab titles should be short, as they take up horizontal width on the page. Long tab titles will not display well and may confuse your visitors. The text block appears beneath the title and functions the same as the Text Block Page Element. For all of the options available in the Text Block, see WiscWeb - WordPress UW Theme - Text Block Page Element. There are two ways to add new panels. Add Tab Button: This button appears at the bottom of all of your panels. Clicking it will add a new tab as the last tab in your Tabbed Content.. The Plus (+) and Minus (-) Symbols: On the right side of each tab, mousing over the gray strip will show a plus (+) symbol and a minus (-) symbol. Clicking the plus (+) will add a tab before the panel you've selected, and clicking the minus (-) will add a panel after the panel you've selected. You can also rearrange the tabs after you've added them. To do this, mouse over the left column and you'll see numbers appear. These numbers coincide with the order of the tabs as they appear on the page. Click and drag the tabs to where you want them to appear. For example, if you want the third tab to appear second, navigate to the third tab, click and drag in the left column to above the second tab, and release the mouse. This should move the tab from third to second, and the second tab should now be third.